My favorite remodeled 19th century hotel. The best college basketball venue in America. Now I can't call Kansas my favorite team. The truth is I want every game to be a buzzer-beater and I don't care who wins. 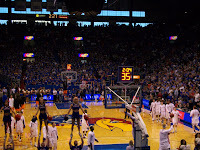 But let's just say I hope the Jayhawk program continues to thrive so I can continue to come back here. Kansas won yesterday to go 8-0 in the Big 12. Now they head to Coulmbia, Missouri for Big Monday that will be the biggest game for Mizzou in years. That campus will be crazed. Let's see what kind of a show the Tigers put on! When you wake in the morn you could do the ever popular Starbuck's or Einstien Bros. (love the bagels & Locs) or for local fair try a native's favorite Milton's, they have big hearty breakfast at an affordable price, but you might want to give yourself some extra time because there is always a line. 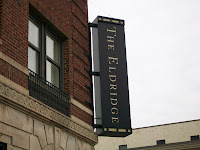 For dinner they have some wonderful options eat at The Eldridge hotel or try Teller's a upscale place set in an old bank. if you think just because your in Kansas which is no where near the ocean and you think they don't have good sushi, then think again. 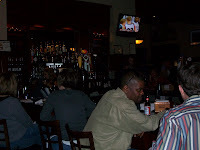 Yokohama's sushi & sports has some real good sushi, and the best part is you can watch your favorite game on a big screen hd tv. 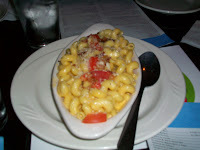 There is so much more to Lawrence than on old hotel with a overrated reputation for being haunted. 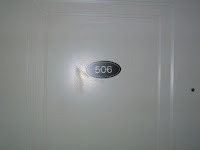 I should know I stayed in 506 the only portal the room took me to was snoozville!